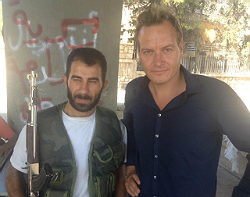 Rasmus Tantholdt: no satellite phone or BGAN in Aleppo. The BGAN is usually an essential tool for the frontline reporter but that’s not always the case in Syria. The reason for the rebels’ rule is their suspicion that the Syrian government forces can pinpoint the location of an active BGAN terminal and then target it. Rasmus recently returned from a trip to Aleppo, a city that has suffered prolonged fighting. The ban on using a BGAN meant he could only transmit from the Turkish border.